Former astronaut James Reilly testified at his confirmation hearing Tuesday. Image: Senate Energy Committee. The nominee to be the next head of the U.S. Geological Survey says he’s inclined to share sensitive data with his higher-ups at the Interior Department if they ask to see it. Reilly is a geologist and a former astronaut. The question of whether political leaders at the Interior Department are allowed to have an advance peek at USGS data erupted this winter. USGS is an independent research arm within Interior, but USGS scientists guard their work from even the appearance of political influence. Their practice has been to let the bosses at Interior see their data only when it’s available to the public. 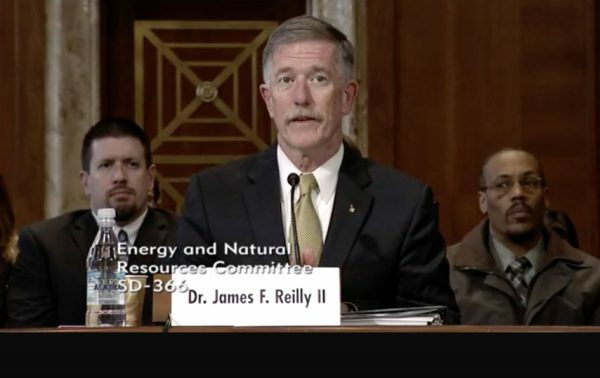 A USGS scientist resigned late last year, and another retired early, to protest the deputy Interior secretary’s demands they turn over data about the oil potential in the National Petroleum Reserve-Alaska before it was published. Reilly says he doesn’t have all the details of the case. He says he’d resist any attempt to alter reports. “If somebody were to come to me and say ‘I want you to change this because it’s the politically right thing to do,’ I would politely decline,” Reilly told the U.S. Senate Energy Committee. Reilly said he would expect his leaders to keep a close hold on confidential information. He also allowed there might be exceptions to his willingness to deliver data to his higher-ups. Committee chair Lisa Murkowski said she hopes the Senate quickly confirms him. Reilly also has Democratic support. A spokeswoman for the Interior Department said in an email last month the Interior secretary and his deputy have legal authority to see any scientific data or draft reports produced at Interior.